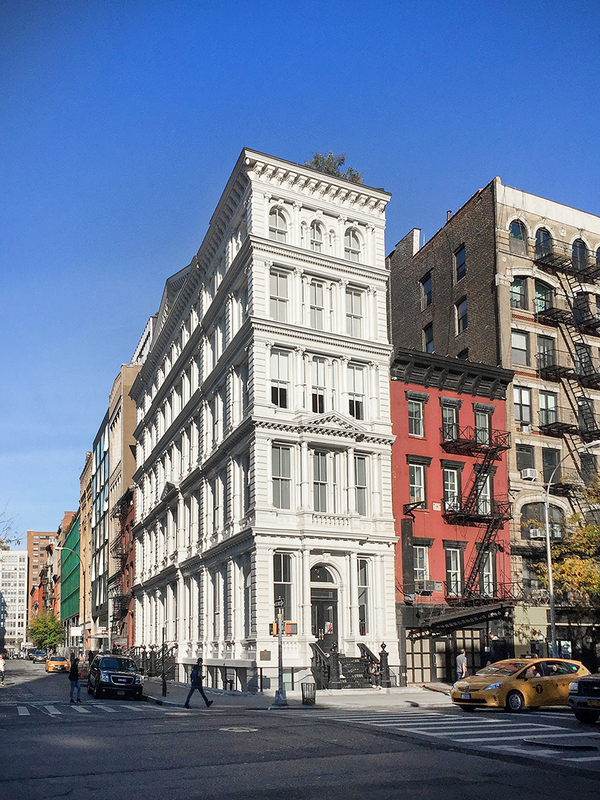 Manhattan, NY 54 Bond St. façade preservation and restoration project has received a 2018 Lucy G. Moses Preservation Award. The international project team for this exterior restoration included architect CTA Architects P.C. ; owner’s representative D+DS Architecture Office; general contractor Traditional Waterproofing and Restoration; Gent, Belgium-based cast-iron fabricator Van Cronenburg Architectural Hardware; and structural engineer GACE Consulting Engineers. Andrews Building Corporation manages the building. 54 Bond St. is a circa-1874, corner cast-iron building in the French Second Empire style. The Lucy G. Moses Awards are the New York Landmarks Conservancy’s highest honors for preservation excellence. The award was bestowed upon the project team on the evening of May 8, 2018 at the 28th Moses Awards, held at the historic St. Bartholomew’s Church, on 325 Park Ave.
“The $4.5 million project was phased, with the first phase being the façade restoration, and the second, final phase being the reconstruction of the sidewalk, which is currently being completed,” said Christa Waring, AIA, LEED AP, CTA’s principal in charge. “It was an extremely involved, painstaking process involving extensive restoration as well as the replication of over 1,000 incredibly intricate cast-iron units, including formed metal cornices and pediments. In addition to the extensive cast iron, there is sheet metal ornamentation on the façade, on elements such as the cornices. All renovation work was performed from pipe scaffolding,” she added. The highly ornate, six-story, 15,000-square foot 54 Bond Street building in the Bowery section of the NoHo Historic District, was designed by Henry Engelbert and constructed between 1873 and 1874 – at a time when the Bowery was a residential and cultural center. Columns surround the windows and a stately cornice was specified for above the sixth floor. A shallow pediment is on the Bond Street side of the building, while Englebert placed a cornice around the building between each floor, to unify both sides of the façade. In the mid-2000s, the Bowery began to improve. It was in 2007 that 54 Bond was purchased and converted into a condominium property with three large high-end residential lofts and two commercial spaces on the first two floors. A few years later, in mid-August, 2011, the owner, 54 Bond Street Condominium, contracted CTA to repair the façade, as it had become somewhat dilapidated. Cast-iron units along the façade were heavily rusted and/or deteriorated, for instance, while there were a number of points of local leakage. CTA, which has extensive experience with both historic restorations and residential buildings, not only restored the façade to its original condition and addressed the leakage, it restored the brick masonry parapets on the northwest side of the structure. CTA designed the facade repair, bid out the project, and performed construction administration services, developing the budget and the trade packages. Before any renovation work was undertaken, however, CTA’s project manager, Matthew Jenkins, AIA, performed an intensive and detailed three-month-long documentation of the façade for two primary purposes: 1) to assess and document the façade’s condition; and 2) to ascertain which cast-iron units would need to be replaced. “It was amazing to see just how detailed each unit was. The intricacy and the decorative and interlocking nature of each unit made it a challenging undertaking,” Jenkins said. He also uncovered some hidden conditions, and stated, “When the units were removed, we found that the cast-iron braces that held them in place had deteriorated, along with the brick-and-masonry backup.” Since these items had to be addressed, they were added to the scope of the project. Most cast-iron buildings are narrow, so their facades are limited. However, 54 Bond is unusual in that it is on a corner. Hence, the amount of cast iron is much more extensive on it than on most cast-iron buildings. In fact, the Bond Street side alone is over 100 feet long. Due to the façade’s beauty and uniqueness – as well as its landmarked status – CTA was careful to avoid using alternate materials that differed from those originally used. In fact, the only modern material the team used was concealed sheet flashing to protect the building’s interior from water penetration. All of the cast-iron units to be replaced were numbered, shipped to the fabricator’s facility in Belgium, and reviewed in detail, allowing the fabricator to create shop drawings, molds, and then create the replicas. The cast-iron pieces were also zinc-metalized to provide additional rust protection and then painted with three coats of epoxy paint. Pieces that were in good condition, on the other hand, were stripped of paint and rust and were then recoated in a phased process. Due to the architectural significance of the building, the team worked with the coating manufacturer, Tnemec Company, Inc., to develop a system for testing the paint, to make sure it adhered appropriately to each element. CTA’s Bradley Heraux, technical manager on the project, noted that the team’s biggest challenge was coordination. “The cast-iron units were molded and replicated in Belgium, while the sheet metal elements were remade locally, in Long Island City, by Gotham Sheet Metal. There were so many different elements in different geographical locations, we really had to coordinate it all very carefully,” he said. “The team collaboration was superb despite the geographical distance,” Heraux continued. In fact, the Belgians traveled to Manhattan for an extensive site review and to create additional documentation of the façade elements. Overall, in order to make the restoration easier and to avoid dust, the contractors removed old paint using a stripper tape impregnated with solvent, rather than by sandblasting. Further, as the windows were somewhat recently replaced, the façade renovation team simply repainted them to match the color of the renovated façade. After the façade work was completed, the second phase began with the replication of the three original cast-iron entrance stairways leading to the ground floor, which is elevated above the street level. One entrance goes to the residential portion of the building, while the other two belong to the retail portion. At some point over time, the stairways had been replaced. CTA designed new stairs to match the originals the team had found in old photographs and from remnants on site. In addition, CTA added new perimeter areaway fencing, ensuring it was both visually attractive and meeting the current codes. The final steps are to replace the sidewalk and renovate underground vault, as well as to restore the historic areaway. The team is currently waterproofing and protecting the underground vault. Of course, CTA worked with LPC throughout the process. All processes, materials, and equipment had to be approved by the agency, even the security cameras installed on the building. CTA specified cameras that were installed using a low profile, so as not to detract from the aesthetics.